Below are two different readings of the poem on this page. The first is from Kunisada: Imaging Drama and Beauty. This translation is by Maria L. Bugno. The poem written at the top of this print is by Shūyatei Kinshō (秋夜亭錦升), Matsumoto Kōshirō V's poetic name. 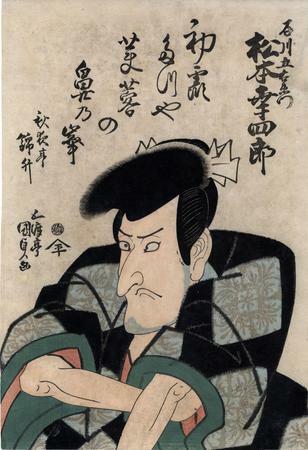 This print is from a series of 12 portraits of kabuki actors in famous roles. Each is accompanied by a poem. Eight prints from this series can be found at Ritsumeikan University. See the link above. It should also be noted that there are two versions of the print featured here. Illustrated with a large color reproduction in Kunisada: Imaging Drama and Beauty by Robert Schaap, p. 88.